Manuka honey has well-known medicinal properties and has gained acceptance in wound care in the treatment of chronic ulcers and burns. Who would have thought that it could be used as an eye drop (Optimel™ Manuka Eye Drops)? For sufferers of some forms of dry eyes and blepharitis, this new product has been a revelation. I have been using it selectively on patients for the past year with great success. Even my mother-in-law uses it daily. Interestingly, Manuka honey has anti-bacterial and anti-inflammatory properties. It is also fairly viscous, the most viscous of any of the honeys, but has the benefit of “thixotropy”, it flows well when it needs to, before returning to its thick, viscous state. As an eye drop, it seems to form a smooth protective coating across the eye surface. The downside is that it stings so much (for about 30 seconds) it will bring tears to your eye. For dry eye patients who have this feeling constantly throughout the day, it’s a small price to pay for symptomatic relief. The stinging occurs because it is naturally hypertonic. This property is useful for patients with Fuch’s endothelial dystrophy, bullous keratopathy and post-operative cornea oedema. 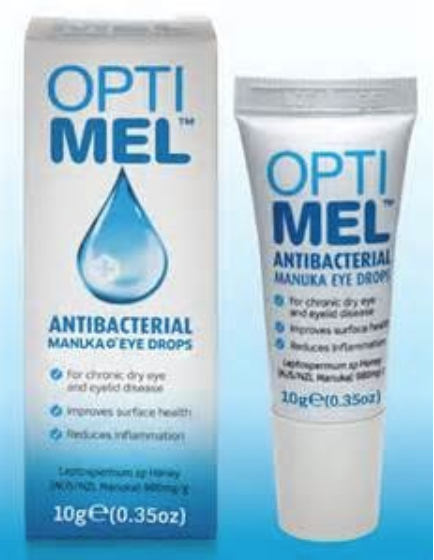 Optimel™ has also been helpful in patients with herpetic eye disease and allergic eye disease. Patients can try it during a normal eye consultation with me, to see if it suits them. Most patients prefer to use it once or twice a day. Some of these patients have needed hourly artificial tears for years to maintain the same level of eye comfort that Optimel™ affords them. It is becoming more widely available in the community, with some specialist optometrists selling it and it is available at the front reception of Queensland Eye Instititute and does not require a prescription. So that’s the buzz about honey eye drops. They sting alright! Just got them yesterday and wondering how long do I have to do this! Hi Grace, with time most patients report the stinging becomes less of an issue. Others cannot stand it, no matter what. Only time will tell. Hi, i suffer from sever allergic conjunctivitis for about 3 years now and some days my eyes are so bad. I have being on eys drops- Flarex and Zaditen on and off for years now. I am now trying Optimel manuka eye drops to see if that will keep the allergic conjuntivitis at bay.My question is will it help me because i am at my witts end, and how long should i use the manuka eye drops for. I deal with a lot of allergic eye disease, and if yours is severe, I wouldn’t be treating it with Zaditen and Flarex. Those are only halfway up the therapeutic ladder. I will email you with some suggested alternatives. Regards Tai. how safe are regular honey eye drops for treating dry eye? Considering that they are sterile and at around 25% w/v solution. Is hydrogen peroxide dangerous for the eye when released in a 25% sterile honey solution? Anecdotally, I’ve been told by an old retired pharmacist that 1:10 dilution of honey:saline was tolerable to patients back in his day. I don’t have the expertise to comment on the safety of hydrogen peroxide. I have been using Optimel for about 4 months now. It still stings but only momentarily. The benefit is I am able to keep my eyes functioning for longer times. I was using Optive advanced eye drops very frequently during the day, the Optimel has reduced this to about twice a day. Tried punctum plugs but I could feel them too much and they didnt help so had them taken out. I have been diagnosed with meibomian and lacrimal gland dysfunction and have very sensitive eyes. My eyelids shut a lot to protect and relieve the discomfort. I do not feel like I have any grittiness in my eyes. I wake up with tired sensitive eyes. As my eyes shut a lot it is a significant disadvantage, people think i have a headache or are about to sneeze as my face contracts to try and keep my eyelids open. Any stress, wind, light etc causes me problems, driving is a major concern. My condition came on after a robust eye infection with lots of antibiotics needed to resolve it. This was just a few months after having radioactive iodine treatment for a thyroid problem brought on by the excess iodine in Bonsoy milk. I think the combination of radiation affecting the eye glands, infection and antibiotics has left the over sensitive eyes. Dr Tai, if you have any other thoughts about how I can repair my eyes I would be very appreciative, this condition affects every aspect of my life. Hi Justine, you have a complex set of symptoms. I would be happy to assess you in person, please call 32395000 to arrange a consultation. I can’t make promises but I will do everything I can to help. The stinging is no issue…lasts a fe seconds. Moreso…there is an instant reaction when the drop hits the eye…not painful as such but a shock and unconfortable…is this likely to ease over time and with use? Have you had much to do with Sjogrens? And the dry eyes problems that go with it? I have extremely dry eyes, chronic dry eyes,it is my main problem with this disease. I have had my lower tear ducts cauterise and still need to use drops constantly. I brought these drop today to try. I am sceptical but willing to give anything ago. I see that this post is over 2 years old. What has the feedback from your patients regarding these drops? Thanks. I hope this has been helpful for you, as it has been for quite a number of other Sjogren’s patients. I have cataracts plus Fuchs dystrophy, and am 75 years old. I have known for sometime that monuka honey is an ancient remedy for cataracts but was hesitant to use it because of having Fuchs dystrophy. I am so relieved to discover that monuka honey , far from being a contra -indication, is actually used in a beneficial way for Fuchs dystrophy. I live in the state of Michigan, in the USA. IS OPTIMEL available here? I am not suffering from dry eye, but I do have difficulty seeing, especially in the morning. I feel like I have spots or smudges on my glasses even tho I don’t. Some days it is more bothersome than others. Is monuka honey helpful beyond dry eyes. Would you recommend using it? Do you have any recommendation for a specific monuka product to use for cataracts? And, are these products available in the States? If not, I would be glad to purchase them from you, if that is an option. Thank you. I am glad to know you are there! Optimal has been beneficial for some Fuch’s patients, similar to how hypertonic saline may be helpful. I have no idea whether this product is available in the USA. It is an Australian company as far as I know. I have seen it sold on Ebay – so maybe best if you try acquiring it that way. Can you use them more often than 3 times a day? If you are having a flare up? Or when you first start? if so – how often?